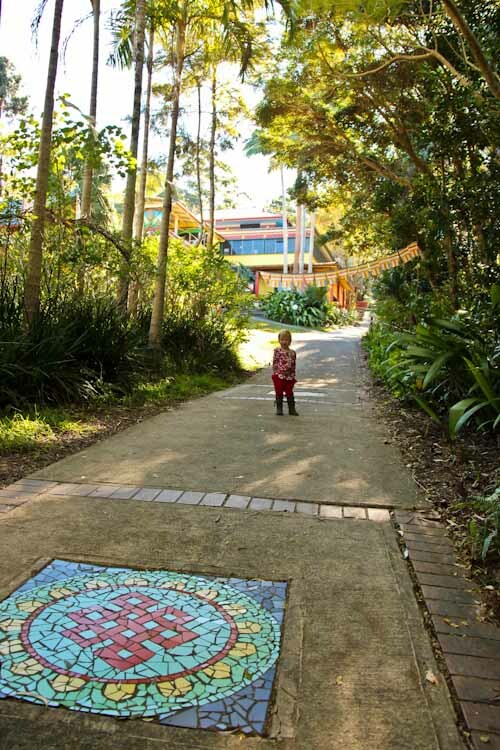 The Tibetan Buddhist Retreat Centre outside Eudlo on the Sunshine Coast is the oldest and still one of the largest in the Western world. 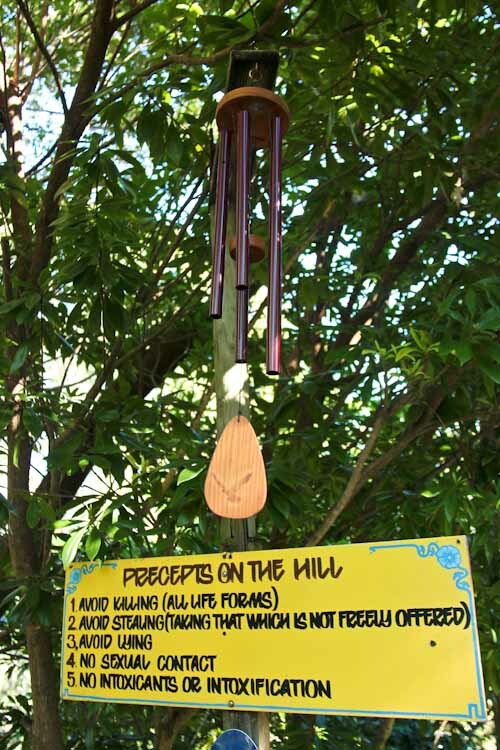 We visited this peaceful place today to see what it was like and liven up the place with our joyful sounds. 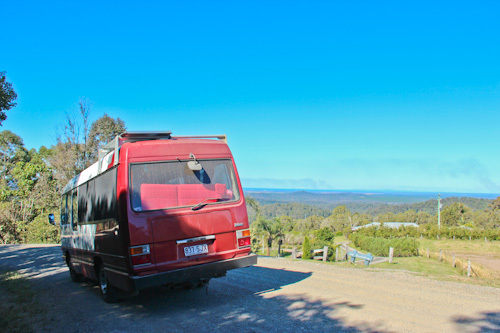 We take a scenic tour along the narrow, winding Brandenburg Road from Maleny to Mooloolah Valley. 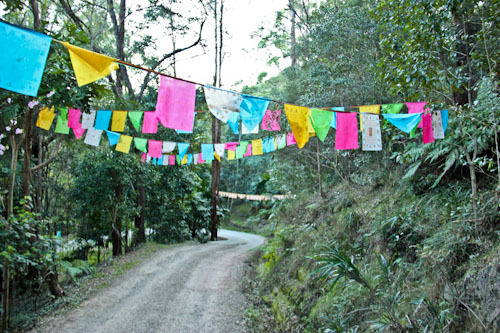 The driveways at the centre are lined with colourful flags, each flapping in the wind to send prayers and positive energy throughout the area. The land at Chenrezig is quite steep, so the road curves as it climbs the hill. The visitor carpark is at the bottom of the hill, but we opted to skip the steps and drive to the café. 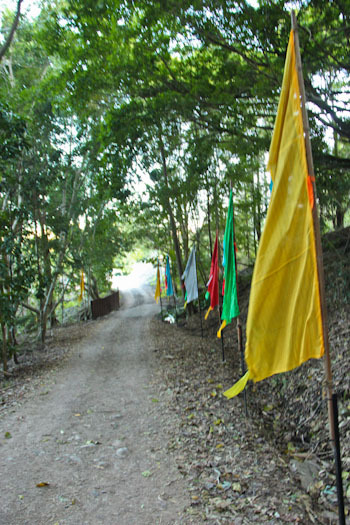 At Chenrezig, a modest dress-code and sober behaviour-code is promoted to visitors and residents. 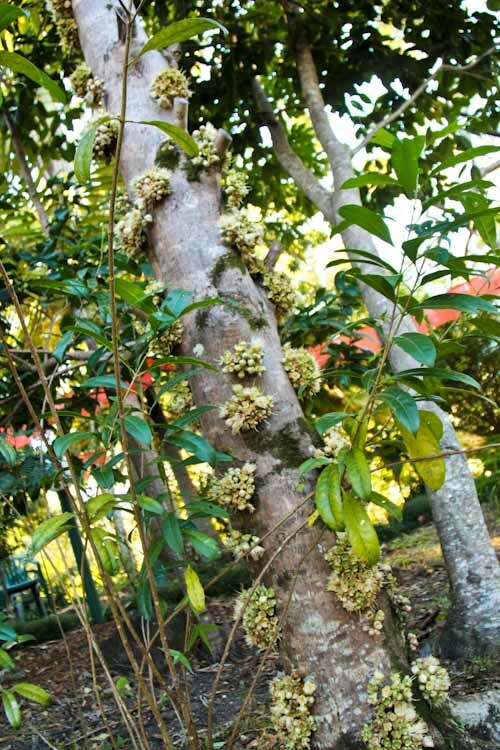 In the gardens, we spy a unique tree — probably an Australian native — with bouquets of flowers growing out of its trunk. Johnny and I wondered if the flowers were real — they are! 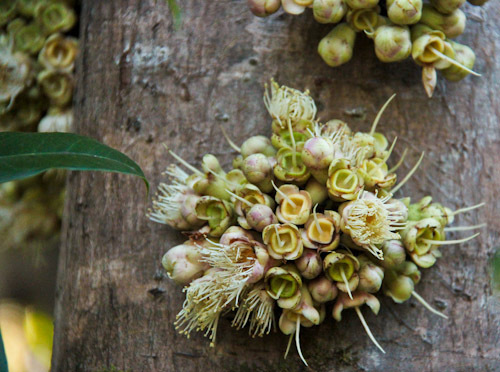 They have a very pale scent and are most definitely just growing out of the trunk. 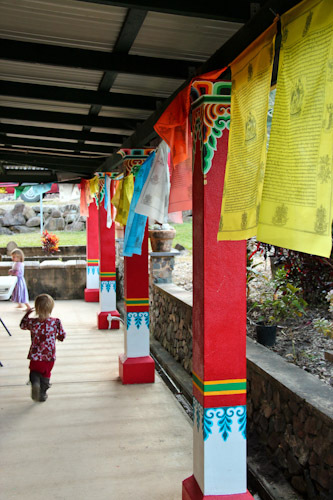 Visitors are welcomed at Chenrezig Institute, and many people come for classes and retreats. Dorms are available for students, and there are communal toilets, laundries and even a fridge to cater to the spiritual-seeker. 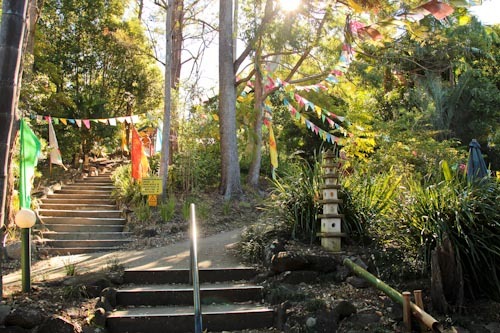 This stupa outside the café is built according to idealised dimensions that represent an enlightened body, speech and mind — specifically, that of Buddha. 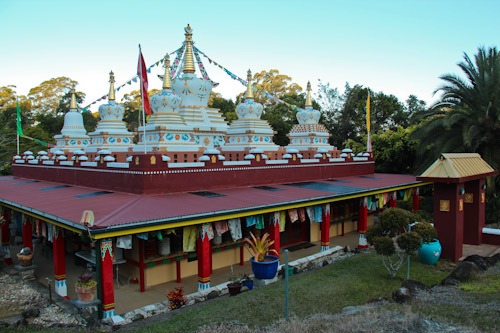 This monument was built to honour the Chenrezig Institute's founder, Lama Yeshe. 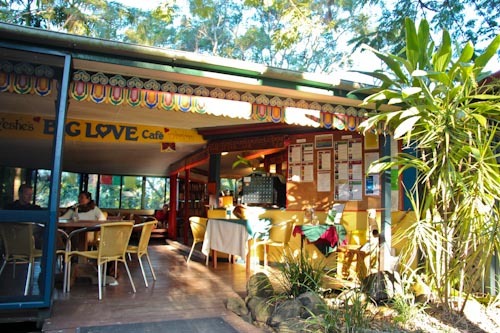 The Big Love Café offers vegetarian food at set meal-times and provides tea and coffee free to visitors and residents. From the café, steps and pathways lead to the temple, the dorms and the monastery. 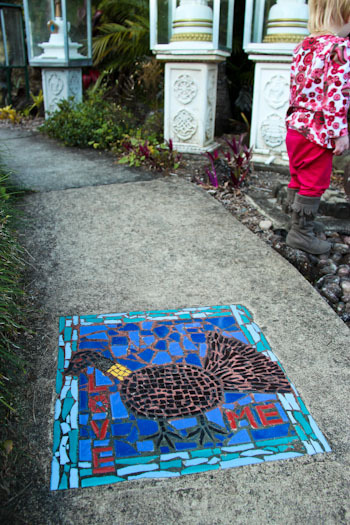 The mosaic in the pathway echoes the colours of the flags overhead. 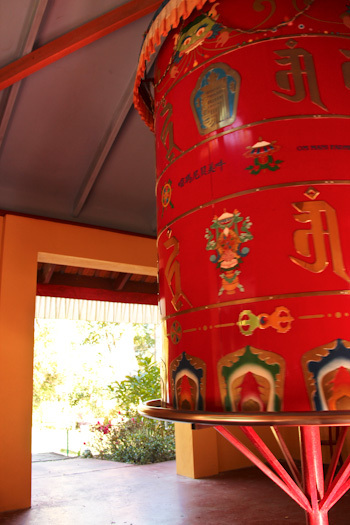 A large prayer wheel sits in its own building. 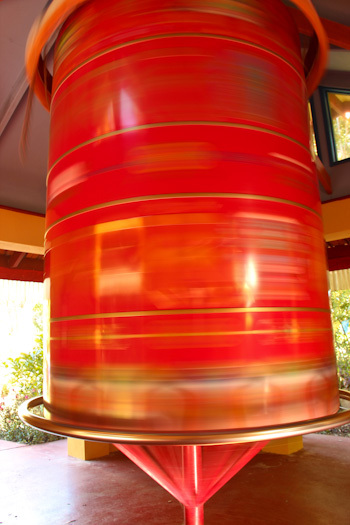 The well-greased wheel is easy to push into motion. 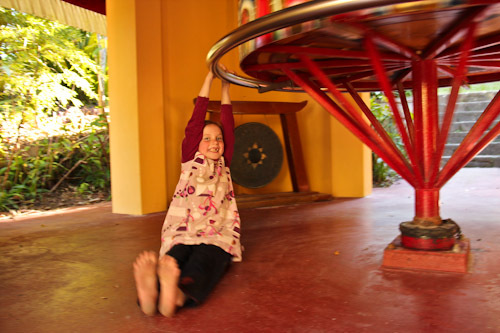 Aisha finds that she can hang off the wheel as it spins. I don't know how sacred this object is, but a child's pure enjoyment of life is surely the apex of an enlightened state. 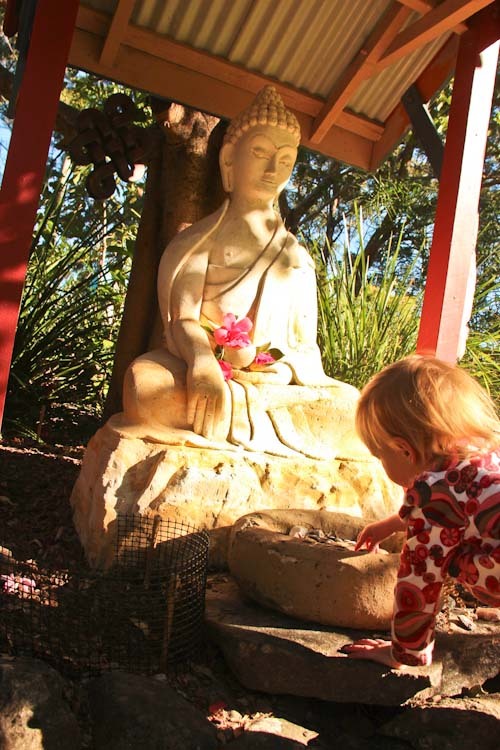 Outside, a statue of Buddha sits under a Bodhi tree — the sacred fig under which Siddhartha Gautama — more commonly known as Gautama Buddha — is said to have achieved enlightenment. 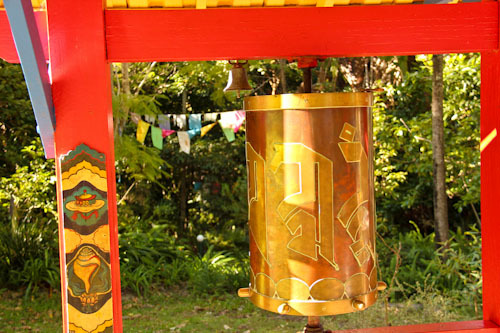 This smaller prayer wheel has a bell which sounds when it turns. Aisha tests out the wheel, predicting when the bell will ring as she spins the base. 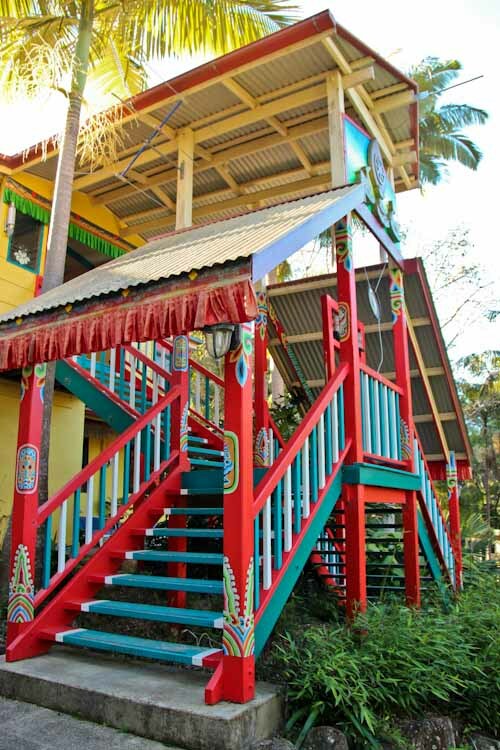 The beautifully decorated Gompa — the temple or meditation hall — is accessible only by steps, something that becomes very relevant when travelling with someone who uses a wheelchair. On the noticeboard, a memo detailing the procedures for offering money to the Lama concludes with this important statement. 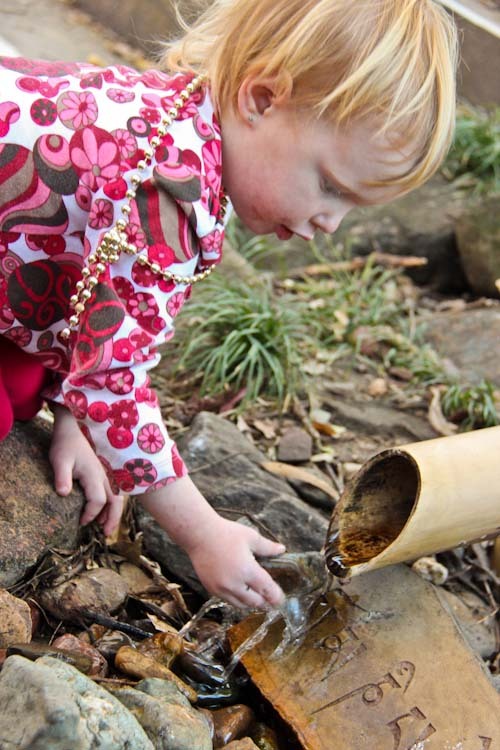 Delaney likes to hold the stones under the spout — one at a time — until they're all wet. Watching her do this is an opportunity for me to practice patience and graciousness. 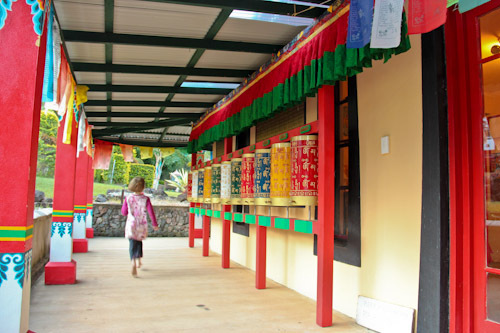 Further down the hill, a large shrine is nestled within manicured gardens. The girls like to explore the building and the grounds. By the time we get here, the workers have finished for the day. 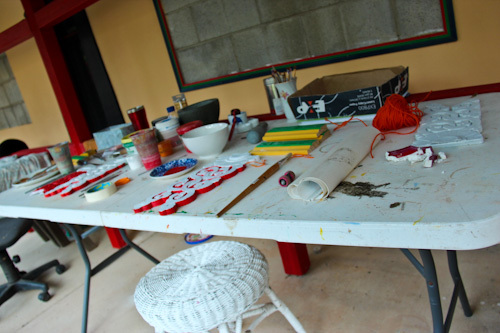 Paints and brushes are left on an outside table, ready to be picked up in the morning. The bush turkey is not one of Australia's finest birds, and so we're encouraged to practice compassion with animals — including this messy invader. 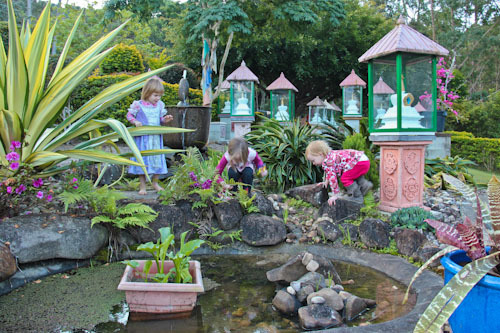 The plants in the Garden of Enlightenment are selected for their shape, perfume and/or colour. 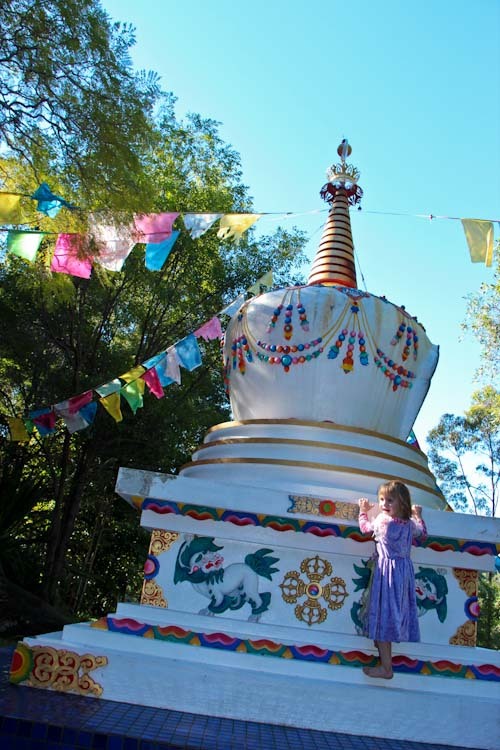 The main stupa on top of the shrine is dedicated to a previous resident teacher at Chenrezig. 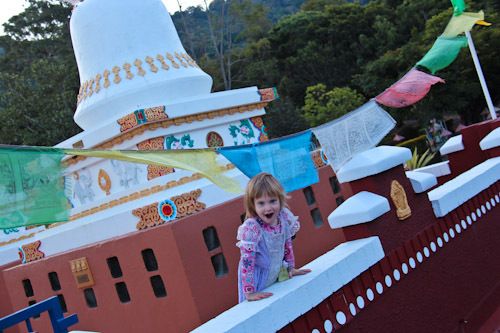 The girls like exploring the roof stupas. Each base has a little doorway, and the girls make stories up about who lives in these tiny boxes and why. 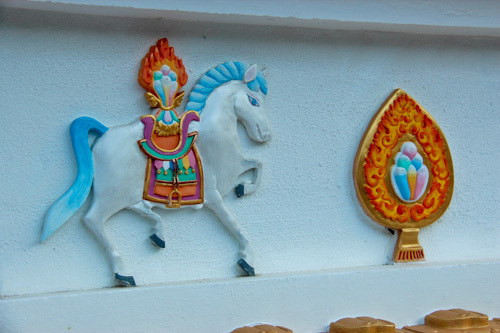 In the Buddhist tradition, the wind horse carries prayers from Earth to the heavens. 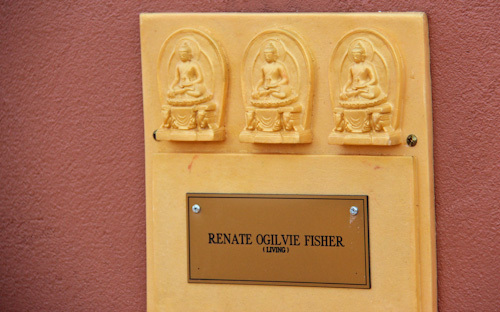 One of the eight roof-top stupas is reserved for a Fisher — still living, apparently. I like the painted pillars — they are cheerful and not too garish. 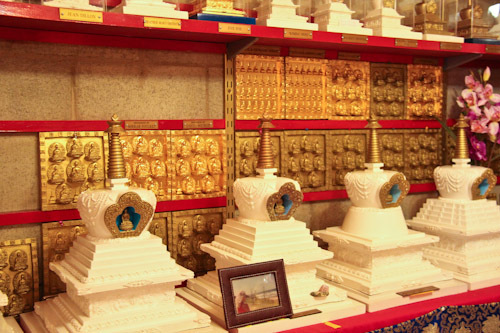 Inside the shrine, smaller stupas and plaques memorialise more faithful Buddhists — both living and dead. 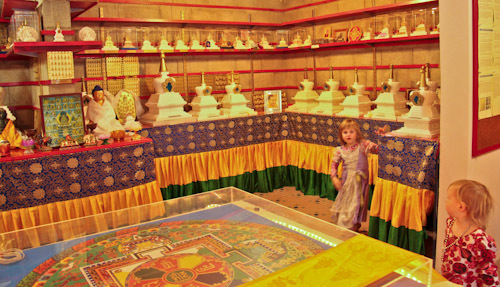 These little stupas are only $1000 while the plaques are priced between $20 and $200 (depending on whether you want your name on the front or the back and if you want a gold-leaf covering). I find the monetisation of religion fascinating and disturbing. 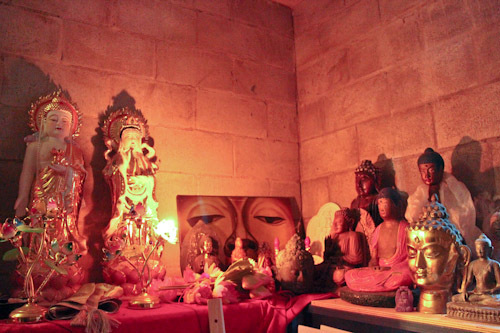 In a back room, a number of small statues are on display. 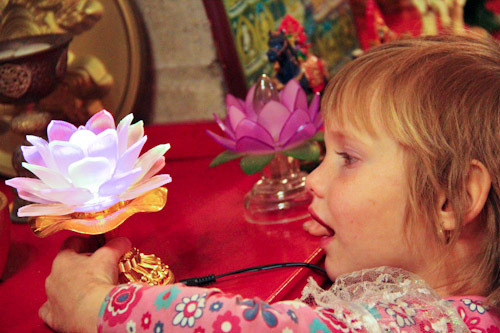 Calista is enthralled by this lotus light — it changes colour and looks "so pretty". We felt welcomed by the staff at Chenrezig. Although they don’t usually allow casual visitors to stay — they’re not a campground — they did offer to let us park at the entrance to their property. After we finished our tour, we decided to drive on, and yet we feel blessed to even have been given the option to spend the night. As we drive home again — content with our adventures — a fat, yellow moon rises to bless us on our journey. This is beautiful! I want to take my kids now! Thank you for the inspiration. You did such a great job capturing that moon! I am so impressed! Mine never, ever, EVER turns out. I was on the phone (hands free) to errol yesterday evening when I came around the corner and saw the most amazing yellow moon rising. He said I was having a ‘double rainbow’ moment I was so excited. I went to the Big Love Cafe with a friend ~ we went on a Saturday, and it was the most amazing Vegetarian meal I have ever had! What a wonderful place. I must put that on my to do list. I’ve decided I need to treat my local area the same as if I were just visiting…..
What a fascinating place to visit – must put it on my list for when I next travel north. I would find the price tags for the monuments disturbing too. It is indeed a beautiful place – and I do just have to add a word of defence to what you have described as the “monetisation” of faith. Churches – places of worship – of many denominations – including plenty of Christian ones – have always placed tributes to parishioners on their walls, plaques on pews, little altars set up in the side naves, statues of saints dedicated to a particular family, plaques on floors, event decorated tombs …. you only have to visit an old church or Cathedral here in Australia and you see lots. These were paid for by the families who wanted their loved ones remembered by the faithful who came there to pray. 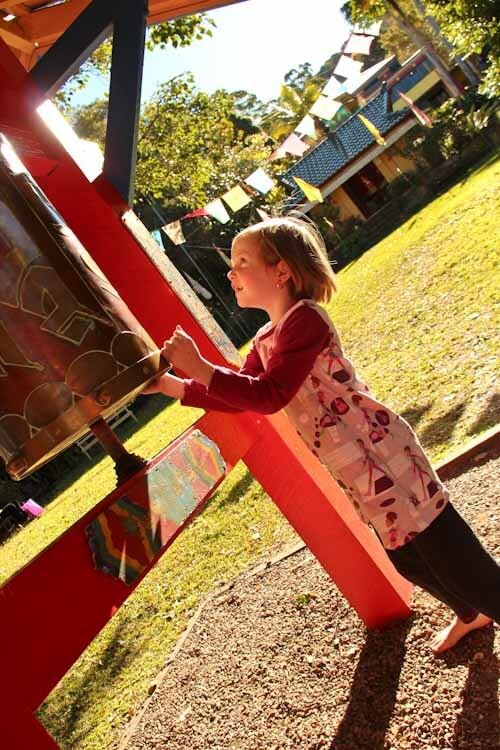 By adding their piece to their church/temple/mosque/synagogue, they have created a place that they can return to to feel close to and remember their loved one – in a communal establishment that holds a great deal of meaning for them. The building and creation of such beautiful places of worship cannot happen without the financial support of the people who believe. This is the way it has been for thousands of years and I think we can choose to look at it with our society’s capitalist eyes – as “religious” goods being purchased, or we can look at it as a contribution being made by a person or family for whom this place of worship is especially meaningful. Hi Lauren, I have read your blog for some time now and have wanted to comment so many times but felt whatever I could say wouldn’t really be able to express my admiration for your conscious effort to transform your thoughts, words, feelings and experiences into wisdom and compassion. I thank you for your inspiration. 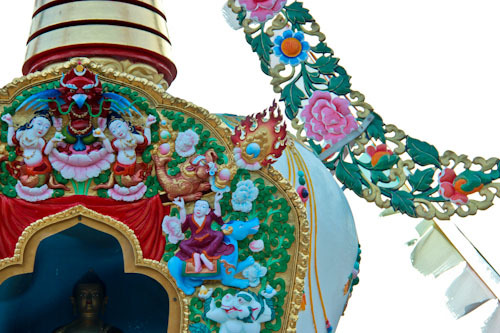 As a Buddhist I feel that our belief systems are very different. It’s important to acknowledge that and I thought your comments on your visit to Chenrezig Ins. were insightful, and I felt you were trying to be objective. I agree that the monetization of religion is really disturbing, and I was once a part of the organization that runs Chenrezig Ins. and feel that this is one of the area’s they need to work on. Lily Boot has some really good points, I think in many religions you will find these kind of practices and culturally, this happens a lot in Buddhism, and yet this isn’t something the Buddha ever taught. He only taught the benefits of generosity with really detailed explainations on how generosity helps us and others. Anyway again, I thank you. While some of the messages of our respective faiths are similar, the paths and result of our paths are completely different. However I really respect your open-mindedness and love your beautiful photos! I wish you and your family joy and peace and my love, thoughts and prayers are with you all, always. Thank you, Lily and Yeshe, for sharing your stories with me. The monetisation of any spiritual beliefs disturbs me, as I believe enlightenment should be shared freely and received freely. This is one reason why I don’t place ads on my blog. I have bought a plot in the local cemetery, where Elijah is now buried. His burial cost over $5000. 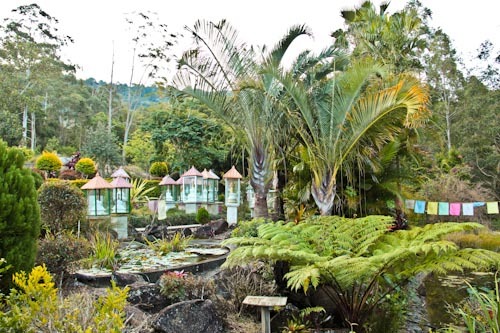 Perhaps I should view the Garden of Enlightenment as a similar sort of arrangement, rather than one that reflects a monetisation of the local Buddhist retreat. At first sight, it’s beautiful! then as you become mindful of your surroundings you notice the rats that run from the other side of the counter at the cafe, or even worse, when you switch the lights off in your motel only to see a rat run out of your bin. Some of the staff there looked like they needed a lesson in customer service. Although i must say the food was pretty good on the Saturday, tasteless on Monday. I never really saw any of the female monks or to say the least any of the male monks out and about doing any kind of gardening. I thought that that was a ritual of there’s..? Either way, my experience there was “not” a spiritual one but rather a realization that not all Buddhist retreats are genuine. I drunk with one of the female monks, got hit on by a french man, But not all was bad, one of my most genuine moments there was with a volunteer who i still think was a “true” holistic person in disguise. Looked more like Jesus than a Buddhist (hehe), but words more wise than most passed his lips. Sometimes when you least expect it, a voice captures your attention. His presence was powerful, but his heart was beautiful, and his words were mesmerizing. I never got his name! shame on me! It never crossed my mind to ask… I wish he had hit on me!